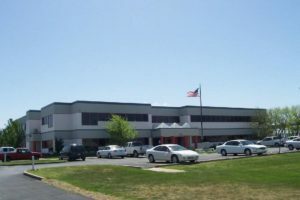 The northeast part of Wichita continues to grow, but Anderson Management is about out of room at its Northrock Business Park at 3450 N. Rock Road. That’s why Anderson partner Ross Way says it made sense to buy the 48,000-square-foot building where the Center of Innovation for Biomaterials in Orthopaedic Research, or CIBOR, used to be a few blocks away at 9229 E. 37th St. North. Northrock’s occupancy is at about 92 percent. Ross says if a potential tenant needs a lot of space, he’s out of options. At the new building, there’s 32,000 square feet of office space on two stories in the front and more than 15,000 square feet in the back of the building that is combination office and warehouse space. That includes new HVAC systems, a new roof, additional landscaping, paint and a new parking lot. The company also is redoing the building’s two-story atrium. Anderson purchased the building two weeks ago. “Now we’re getting in to talking to people about leasing,” Way says. He says the building doesn’t have a name yet. Way says Anderson’s partners are also open to buying more buildings.